However, conditions are soon expected to worsen for much of Bangkok. This is due to its vulnerability to the impacts of climate change, as well as the ongoing sinking or land subsidence that is threatening the city. The implication is that while the sea level rises, the lowering of ground level continues, leaving the city doubly vulnerable to urban flooding. Climate change is forecasted to hit Bangkok, as well as the other Southeast Asian megacities of Jakarta and Manila, hardest. The 2017 Global Climate Risk Index by the non-governmental organisation Germanwatch, has ranked Thailand in the top 10 countries most affected by climate change for the last two decades. Newly added to the index, Thailand landed on the list after the 2011 flood event, which cost the nation US$46 billion in repairs and rehabilitation. US$8 billion was spent on Bangkok alone. More than 800 deaths were recorded and 13 million people were affected by the flooding. In a case study on Bangkok assuming a scenario of a four degrees Celsius temperature increase, without adaptation measures, the city was predicted to experience severe flooding. Under these assumptions, the city was expected to experience around 40 percent inundation by an extreme rainfall event and 15 centimetres (cm) sea-level rise (SLR) by 2030. A further expansion of the prediction showed 70 percent inundation and 88 cm SLR by 2080. While adapting to climate change is key to maintaining and improving Bangkok’s liveability by reducing the occurrence of urban flooding, other non-climate-related factors such as the issue of land subsidence can be more important. Bangkok, along with Venice and New Orleans, are three cities which are sinking 10 times faster than the rising sea level. According to some estimates, parts of Bangkok are sinking by two centimetres annually. For some parts of the city that are now only half a metre above sea level, these estimates are very worrying. The city of Bangkok was developed on a marshy stretch of land in the Chao Phraya delta to accommodate a new capital after the fall of Ayutthaya to the Burmese Empire in the 18th century. It is built on highly compressible layers of soft clay. The sinking of the city is mostly driven by the sheer weight of the built-up urbanisation, as well as uncontrolled groundwater extraction. A World Bank report entitled ‘Climate Risks and Adaptation in Asian Coastal Megacities’ identified Bangkok - as well as Vietnam’s Ho Chi Minh City - as having experienced nearly a two-fold increase in damage costs between 2008 and 2050 due to land subsidence. It is predicted that almost 70 percent of the increase in flooding costs in 2050 for Bangkok will be due to land subsidence. “Analysis carried out in the city case studies shows that sound urban environmental management is also good for climate adaptation. 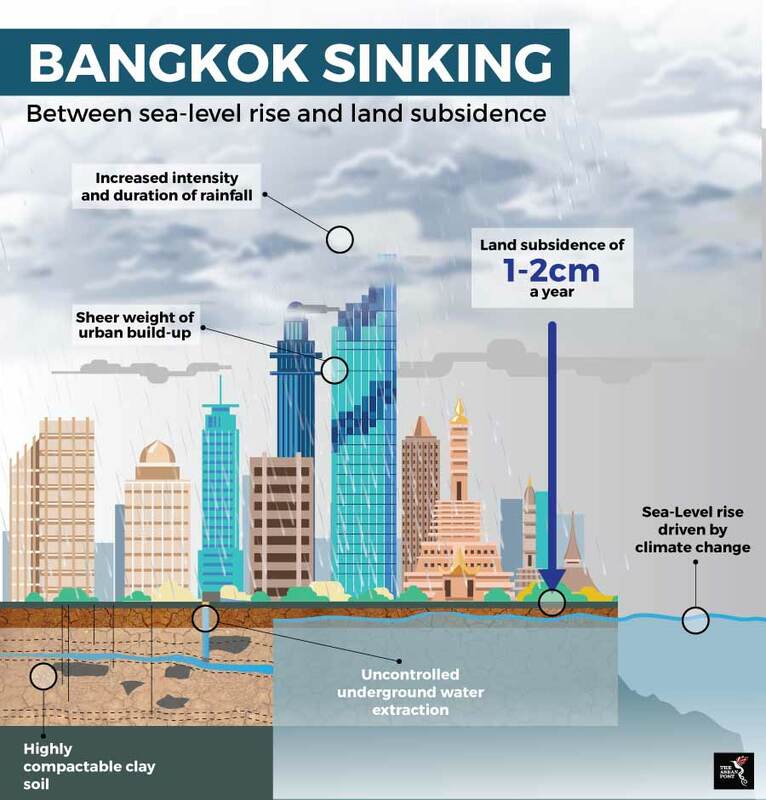 As the Bangkok study shows, land subsidence, if not arrested, would contribute a greater share of damage costs from floods than a projected change in climate conditions. Thus, addressing land subsidence and factors contributing to it is important from the perspective of urban adaptation,” the report stated. Between climate change and land subsidence, the Thai National Reform Council predicts that the city of Bangkok could be under water in less than 15 years. For an urban agglomeration such as Bangkok, where the nation’s millions build and rely on for work and life, the challenge of increasingly severe urban flooding will have untold impacts beyond its geographical boundaries. Governments need to stop sidestepping the issue and urgently assess the driver of land subsidence in Bangkok. Without effective action to mitigate the issue, the impacts of climate change will be only be magnified further.